Hexagonal cores with special high-carbon steel make these great for tone, projection and longevity. 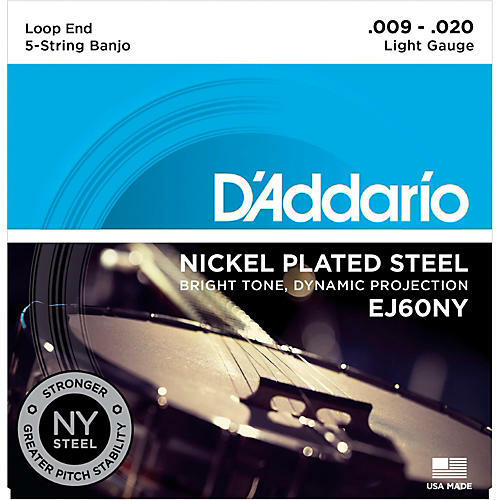 D'Addario's EJ60NY light banjo strings feature plain strings and hexagonal cores made of their revolutionary NY High Carbon Steel for unprecedented strength and pitch stability. This set offers light playing tension for a comfortable feel with bright tone and dynamic projection. These sets are loop-end construction for universal fit. Envisioned, perfected, and manufactured by D'Addario in New York, this newly engineered, break-resistant, high-carbon steel core and plain steel alloy delivers unprecedented strength and pitch stability. Combined with reformulated nickel-plated string windings, NY Banjo sets are designed for crisp, projecting highs and a truly complex overall tone.